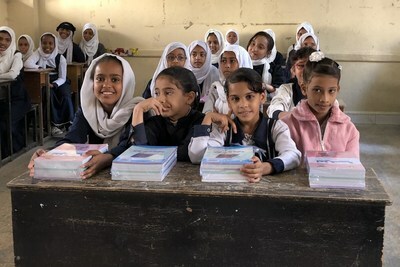 RIYADH, Saudi Arabia, Dec. 17, 2018 /PRNewswire/ — The Saudi Development and Reconstruction Program for Yemen (SDRPY) is distributing school supplies in Al Mahra, the easternmost province of Yemen. SDRPY staff are delivering 192,000 books, 10,000 book bags, 6,000 desks, and twelve 30-passenger school buses. These materials will benefit some 26,000 students in 150 schools throughout Al Mahra Governorate. Since the Houthis launched their campaign to take over Yemen in autumn of 2014, over 3,500 schools have been shut down. In addition, UNICEF Yemen reports show schools throughout Yemen have been affected by damage from direct attacks, looting, threats, and conversion to military use, including the Houthis’ storage of weapons and equipment in school buildings. The UN also has concluded that Iran-backed Houthi militias have been recruiting child soldiers, forcing children out of their schools and into war zones. SDRPY officials are touring the region with officials of Al Mahra Governorate, who work closely with the Yemeni government to implement SDRPY projects across a wide range of sectors. Officials from the Yemeni ministries of health, transport, electricity and energy, and public works and infrastructure are also accompanying the tour. SDRPY projects inspected include: (1) a new 12-classroom primary school in Nishtun, which is being constructed in line with the specific requests of local residents; (2) 10­­­­­ recently-dug wells and a 20-km water conveyor line connecting Wadi Fouri to Wadi Jiza, from which it will enter the distribution network serviced by the largest water tanker in Yemen; (3) a newly constructed dialysis center, operating room and ICU at Al Ghaydah Central Hospital; (4) the expansion and improvement of Nishtun port through the provision of a 264-kW generator (KVA330), 30-ton crane and 5-ton forklift; and (5) the delivery of fifteen 5,000-liter Mitsubishi tanker trucks.